The legislation is in place to, simply put, stop people from walking into your glass. By placing markings at strategic points on the glazing, it makes the glass clearly visible and prevents accidents. 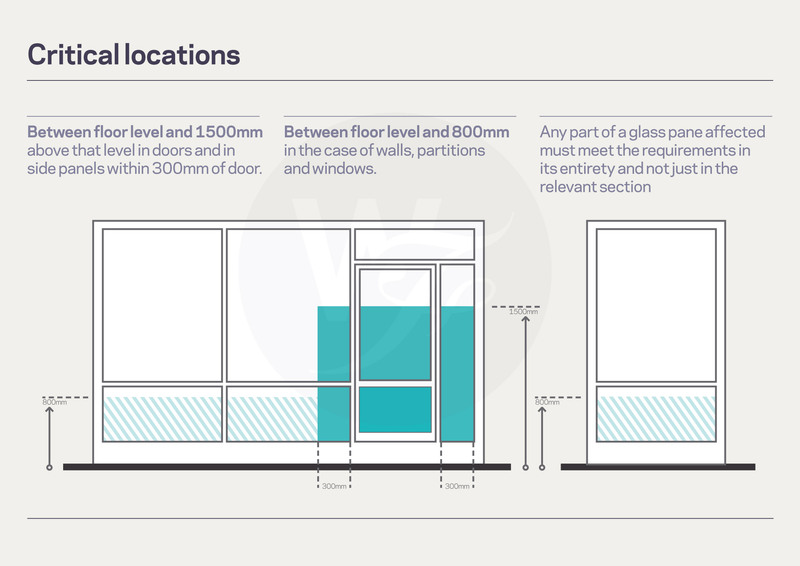 Glass manifestation should be applied to what the building regulations refer to as critical locations; between 850mm and 1000mm, and between 1400mm and 1600mm above the floor. The material used on the glass must provide a contrast between the glass and the background. Manifestation is traditionally created using a frosted film, the appearance of the film providing the glass with an acid-etched finish. Designs can feature simple patterns such as dots or squares, or can also take the form of strips or bands. Glasscare offers a range of these standard designs. Whilst manifestation is required by law, it also provides an opportunity to add an extra creative dimension to glazing. It can take the form of company logos or other bespoke patterns, with Glasscare being able to recreate artwork in full colour on a range of films; a manifestation solution tailored to exact specifications. Glasscare's in house graphics team are able to work closely with clients to discuss the available options, using state of the art design and cutting equipment to recreate designs in perfect detail. With teams of professional installers operating throughout the country, Glasscare are able to guarantee not only the best possible product, but the best possible installation.